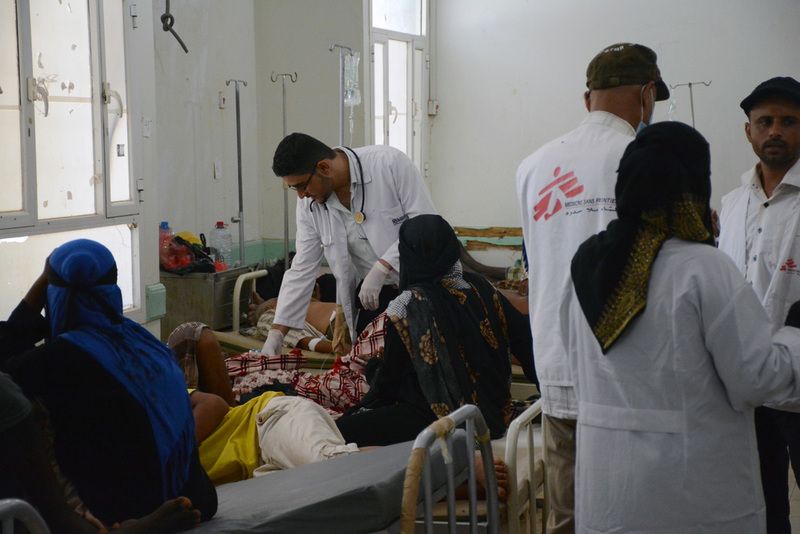 By 4 December, 318 suspected cases of diphtheria and 28 deaths had been reported in 15 of Yemen’s 20 governorates. Half the suspected cases are children between the ages of 5 and 14, and nearly 95 percent of deaths are children under 15. Nearly 70 percent of all suspected cases are in Ibb governorate. Diphtheria is a contagious and potentially fatal bacterial infection characterised mainly by a thick grey membrane at the back of the throat or nose, sore throat and fever. It can be prevented through vaccination. “Globally, diphtheria has been eradicated from most countries after systematic childhood vaccination campaigns, and it’s become something of a neglected and forgotten disease,” says Marc Poncin, MSF’s emergency coordinator in Ibb. Poncin adds: “After two and a half years of violence and a blockade on supplies including medicines and vaccines, the healthcare infrastructure is in tatters. “The blockade on fuel has meant that patients cannot afford to travel to the very few health centres still operating across the country. Humanitarian organisations are also struggling to start diphtheria treatment and prevention activities due to the ongoing logistical difficulties bringing specialised staff and needed supplies into Yemen and to areas where they’re most needed. “Globally, the decline of diphtheria in recent years was accompanied by a concrete loss of knowledge regarding its treatment. A child lies on a bed in the MSF cholera treatment centre at the Al Thawra hospital in Ibb governorate, September 2017. “This is making it much more difficult for health workers to quickly and correctly identify, isolate and treat cases. “To treat diphtheria, patients need to be isolated and receive antibiotics and anti-toxins. To tackle the outbreak, MSF, together with WHO, is acquiring most of the anti-toxin that is still available worldwide, and ordering more antibiotics. We have also put together a rapid response team to survey and identify suspected cases in communities, and provide prophylaxis to those in contact with a diphtheria patient. On 11 December, MSF opened a Diphtheria Treatment Unit in Nasser Hospital in Ibb city, and is in the process of supporting two others in Yarim and Jiblah hospitals - the later with Intensive Care Unit capacities. An ambulance referral system will also be set up to transport suspected cases to hospital. We will additionally support transport of samples to a laboratory to better confirm cases, and carry out health promotion activities to alert communities to diphtheria. Meanwhile we are also setting up an intensive care unit in Sadaqa hospital, Aden, where 14 cases were recorded, resulting in four deaths. “We have been visiting houses where six or more displaced people are living in very cramped conditions,” says Poncin. “In such settings, there are no ways to properly isolate cases, and it creates the perfect conditions for diphtheria to spread. “Isolating and treating patients, offering preventative care for affected communities and raising public awareness is therefore crucial to halting the spread of diphtheria.